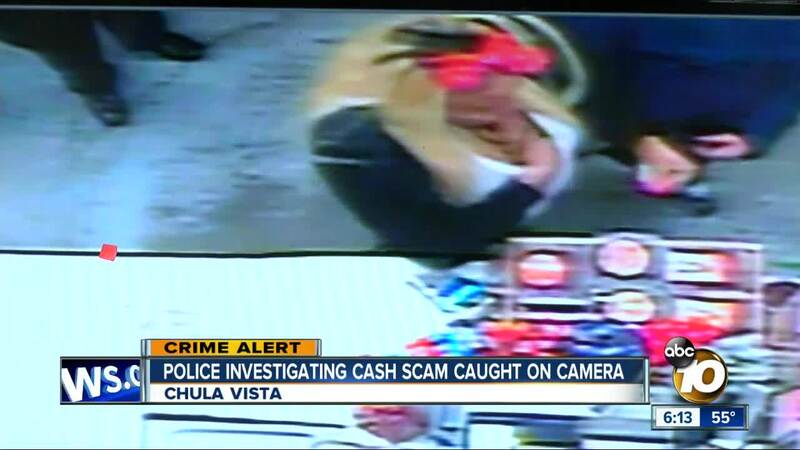 CHULA VISTA, Calif. (KGTV) - Chula Vista Police are investigating an apparent cash scam captured on surveillance camera in Chula Vista. Security footage from Hilltop Market shows a woman switch a $100 dollar bill with a $1 during a transaction at Hilltop Market. Naemi says the incident happened Tuesday afternoon while the store was busiest. The customer wanted to buy something with a $100 bill but then changed her mind mid-purchase and asked for her money back, according to Naemi. Video shows the woman take back the hundred with her right hand and put it in her bra while presenting another bill with her left hand. “I saw something go in her brassiere area and she ended up turning right around and telling me that I handed her a one dollar bill,” said Naemi. Naemi offered to show the woman security footage challenging her account then the woman looked into both sides of her bra before presenting the $100 bill. Surveillance images show the woman point at Naemi several times before walking out. Naemi says she shared the video to alert businesses in the area.